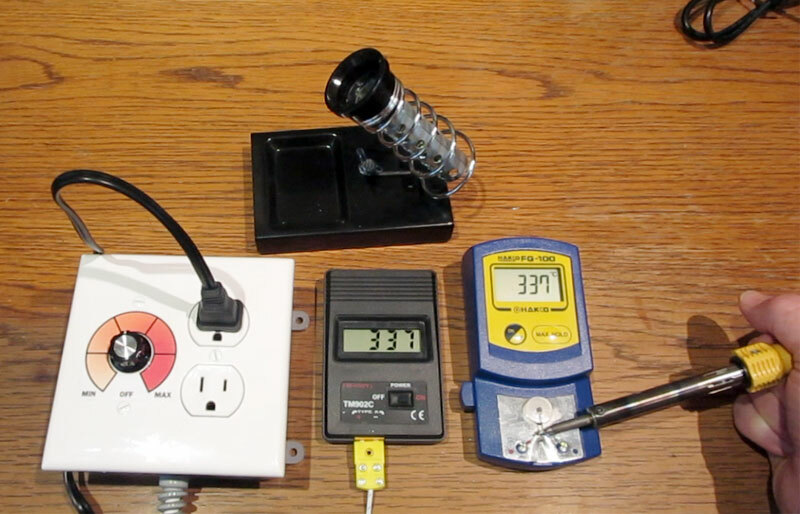 This is a follow up post on the second version for how to modify a regular plug-in soldering iron to work with a digital temperature controller. The goal is to find the right location for the thermocouple inside the soldering iron. Temperature readings can be affected by the smallest change in position. The location of the thermocouple is very sensitive. Plug the thermocouple directly into a K-type thermometer and plug the soldering iron either into an AC outlet or in this case into an outlet controlled by a dimmer switch like in the photo above. This will allow you to dial down the temperature so the soldering iron won’t get too hot. When installing the thermocouple expect to disassemble and reassemble the soldering iron a few times to get it right. Minor adjustments can be made without disassembling the unit simply by gently pulling or pushing on the thermocouple cable at the rear of the soldering iron. The thermometer will display the internal temperature of the soldering iron according to the reading of the thermocouple. Compare this temperature with the external temperature of the soldering iron using a tip thermometer. Generally, the deeper the thermocouple is positioned into the soldering iron the hotter the temperature reading will be and the more shallow the position, the cooler it will be. If the temperature reading needs to be hotter then the thermocouple should be located more deeply inside the soldering iron. Adjust the thermocouple by gently pushing it inwards towards the soldering iron. If the temperature needs to be cooler then the thermocouple should be located in a more shallow position inside the soldering iron. In this case adjust the thermocouple by gently pulling it outwards away from the soldering iron. The amount of movement of the thermocouple cable is imperceptible. It should not slip. It should be firmly secured to the power cord with zip ties internally inside the soldering iron. The power cord should be secured with proper strain relief and should not move in or out of the soldering iron. Be careful not to put too much tension on the heating element lead wires. You don’t want them to break and cause an electrical short. This is a bit of a delicate process, but it can be done. Watch the thermometer while you are making any adjustments. Stop pulling or pushing on the cable as soon as the thermocouple temperature reading equals the tip temperature reading. The slightest amount of tension can change the thermocouple reading by several degrees. With a little bit of patience it is possible to adjust the thermocouple for the best reading.